Freedom And Liberty: Month-Old Eaglets Get Names In D.C. : The Two-Way More than 36,000 online votes were cast in the competition to name the two young eagles, the American Eagle Foundation says. Names such as Cherry and Blossom lost out. Which one's which? 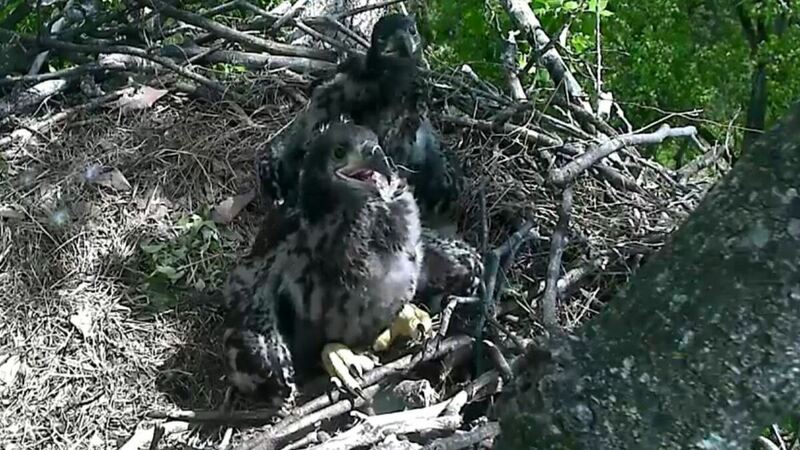 Two eaglets were born in Washington, D.C., last month; they've now been named Freedom and Liberty. More than 36,000 online votes were cast in the competition to name the two young eagles, the foundation says. The winning names of Freedom and Liberty were announced via the Friends of the National Arboretum Facebook page, where voting was closed just before midnight Sunday. "Those names were my second choice," Facebook user Diane Morris wrote on the group's post announcing the names, "as I still prefer Honor and Glory as there are no known eagles by those names and they represented the integrity of the parents. Well done people, I was so afraid they would be named Stars and Stripes."